French magazine Le Point cast doubt in an investigative report over Qatari attorney-general’s wealth. 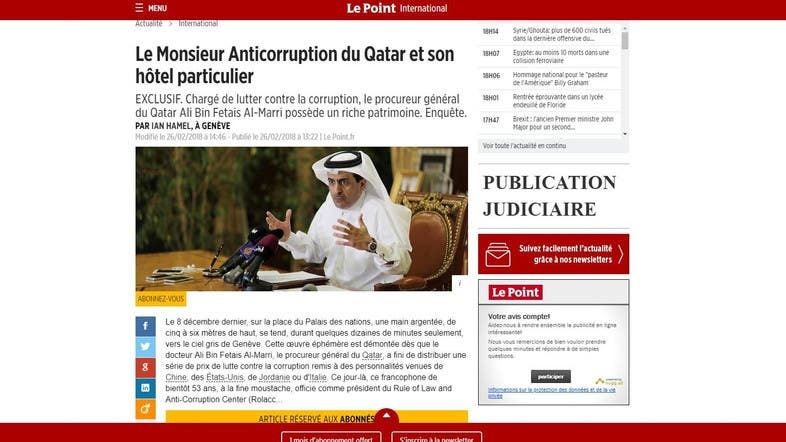 Le Point, one of the top five national magazines in France, called into questions Qatari Attorney-General Ali bin Futtais al-Marri status as a minister and official focused on anti-corruption cases given doubts raised regarding the source of his own wealth. According to the magazine, he is not only carrying out his duties in Doha but he is also well present in the international scene since he oversees the so-called Rule of Law and Anti-Corruption Center funded by Doha in Geneva. Le Point reported that al Marri does not originally come from a wealthy family but that nevertheless, in October 2013, he purchased a three-story building in 83 Avenue d’Iéna near the Arc de Triomphe in Paris for 9.6 million euros, which raises questions about the source of his fortune. The article's writer, who is LePoint's correspondent in Switzerland, Ian Hamel said also that Qatar signed a check worth 18 million euros to renovate the UN building in the Swiss city. The French magazine also asked “whether the activities of the Qatari prosecutor are an attempt to polish the image of Doha and divert attention from the suspicions of bribes and the purchase of votes associated with the file of the World Cup 2022. Le Point said that it tried to get an answer to its questions regarding Al-Marri's properties but hasn’t received an answer. The magazine also tried to get a comment from Abdel Mohsen Hamad Fattis (his relative who is secretary-general of the Anti-Corruption Center in Geneva) but the latter did not comment.